Handmade Soap inspired by the rugged beauty of the Big Sur Coast. This amazing blend of quality oils can be used to for your beard, as well as a facial moisturizer. 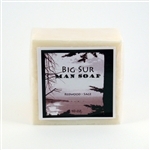 Big Sur is one of our top-selling scents. Men and women love it ...take a walk through the Redwoods - Soak up the Coast!